I am finding that although tricky in order, the final riveting of the flap is pretty easy. I guess I might take back some of the words I said yesterday about it being as hard as the ailerons. All up they may be easier, but I am not done yet and I hope it doesn't end up warped, which the directions say can easily happen. Here the flap is in the stand I built which holds the shape as you take the spar out to reach the inside for bucking. I also realized that I am able to shoot and buck these myself, so I am not needing to pull in Bekah's assistance on this one. Here you see inside the bucked rivets that I was able to get to with the tungsten bucking bar. Tape evenly wrapped around it makes for a nice stable bucking set up. Also, a small piece of cardboard in the bottom of the flap (not shown) covering the rear spar adds safety. I am leaving the end ribs till last to make sure I am able to test the straightness before setting those. In this picture you can see the nutplate and the challenge I will have at bucking that rivet underneath it. The instructions indicate that the flaps are the simplest control surface to build for the RV. That simply isn't true, other builders have indicated such and I agree. There is much more fabrication and the rivet/final assembly stage is much more unique and "tricky" than with the ailerons. Here I am begining final assembly and you can see I have already riveted the root rib and stiffeners together. As well, the stiffener is riveted onto the spar, but they are not riveted together since the spar must be removed in a later step. Also, I have installed the nutplate for the actuator bolt and clecoed everything together except for the top skin. Riveting the final skin on there are several rivets that you can't reach. The only way to get in is by removing the main spar, so a jig needs to be made which I will do tonight. Even then you are blocked by the rear spar, so on the inboard rib, the final two rivets on the top skin and bottom must be pop rivets. Also, many builders have trouble getting to the rivet under the nutplate, so we will see how I do. Maybe the tungsten bucking bar will save me here. As I said riveting order is key, I have also already riveted the back of the inner ribs to the rear spar. Once you start getting the skin in place, this also in unreachable. Flaps - Yes, I still am using alodine.. I am still using alodine and here is the proof.. At least I use it for all parts that fit into my alodine bath that is already set up and just gets pulled out when the time is right. Most builders I think stop using this stuff after the empenage because it is an extra step and not a very healthy on at that since the stuff can be pretty bad for you. I should probably stop, but I have it and it does provide much better corrosion protection, so I am sticking to it for now. The process starts with dipping the part in the alumiprep bath, then rinsing, then dipping in alodine for a few minutes and rinsing again. Here you see my set up, and the final product. I full set of innards for both the right and left flaps ready to prime. For the skins, hinge, and spar I will only use the alumiprep because they won't fit in my bath... After the alodine you see the desired gold color that will resist corrosion for years. I started out the weekend taking the flaps apart just to clean them up abit. There really is a lot of drilling on these and the mettal shavings get between layers and everywhere. Once I got them kind of cleaned up I countersunk the spar where the flap hinge attaches. The directions indicate sjuch so you don't have to dimple the soft hingle aluminum which provides extra strength. After the one side of the spar was countersunk, I assembled the flaps and drilled the skins. After the skins are drilled, the 3-4 hours of deburring and dimpling takes place. Every little step takes much longer than you expect. Don't forget the soldering iron on the skins to remove to top layer of plastic.. However, after a days work, I have both flaps at the same stage and ready for the scuffing, alumiprep and alodine treatment. What a mess. The flaps require a lot of drilling and fabrication of angle to make the required support, also many of the holes are not full size so you need to drill them out creating a lot of metal everywhere. I made tons of progress tonight though and apart from the match drilling of the skins I am almost ready to prime both flaps. I saved the skins because I want to clean up this mess a bit before I get them out and start working with them. The flaps are quite visible and I want them to be fairly pristine. Here you see both skeletons all drilled and fabricated. The inboard rib takes the most work, you need to bend the doubler you see in the picture to approx 6 degrees and then fabricate the joining stiffener out of angle and drill all holes through the spar and through each stiffener. I am happy to say I am keeping both flaps at the same stage through this process. Tomorrow I will make final match drill for the nutplate that connects to the flap actuator and final drill the top skin. Then onto deburring, countersinking and dimpling for the final steps and priming. Wow, I can't believe it has been a week since my last post. I was a bit busy with work last week though, but no excuse. ;-) This weekend I was able to finish up the second Aileron, and did a lot of work on the wiring and rigging in the wing. Just some random pictures here. I might send my wiring pics around to some other homebuilders to get a feel for how I am doing. 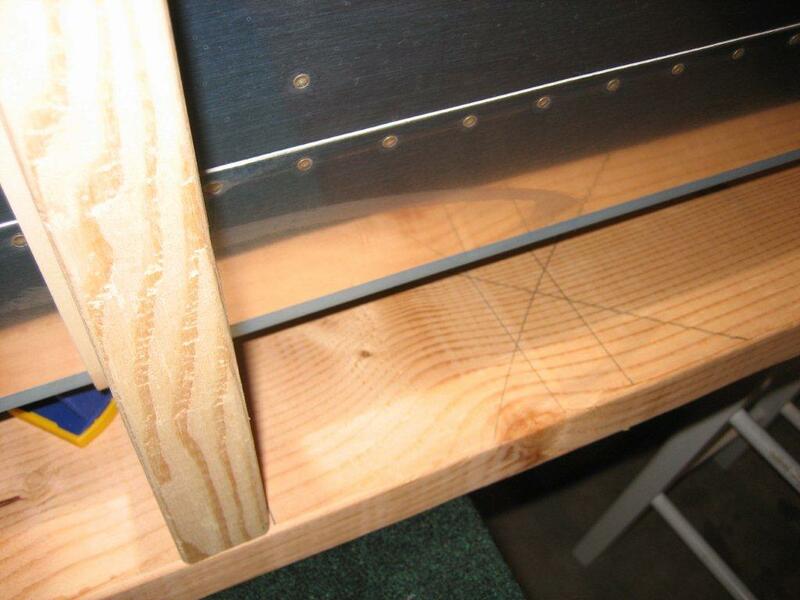 Here are some pics Bekah took as we did the final riveting on the left aileron. Here you see the Autopilot roll servo and bell crank complete. Things to look at here are the torque seal, the primed spacer tubes, the 7 wire connection is basically D-sub pins and sockets surrounded individually by shrink tubing then the entire bundle in a larger heat shrink tube. Also where I exited the conduit, I used a zip tie and RTV silicon to prevent chafing. The wire naturally pulls itself away from the servo bell crank parts, but I also used a sticky zip tie holder that is used by homebuilders in general to tie off electric wiring. If you ask me this will last 20 years in a high vibration environment. Oh, and also note the cable RG-58 for the wingtip antena. I routed it around the aileron servo and used bushings through the rib web. Van's said this was OK. I also did some work on the pitot tube electrical, and will get some pictures up of that shortly. I also got a healthy start on the flaps; Fitting the skeletons together and drilling out the hinge. You can see the clamps I used to keep the hinge inline while I drilled. I was so happy to be able to work on the plane most of Saturday. It was great to get a long stretch of time to mess around in the shop and work on lots of odds and ends, but most importantly finally finished the right alieron. I laid it upside down on a flat surface (very carefully) and weighed it down to make sure its flat, before working the end rib rivets, then onto the pop rivets across the bottom spar. Turned out fairly nice, and didn't scratch it a bit. After the aileron was complete, I test fit it on the wing. Makes the wing look really thick in the stand but definitely cool. Most people flip the wings into the cradle before mounting the aileron. I was able to get under the wing pretty easily so just went for it. Also, this weekend I fished a few wires up the conduit, started working on the right wing antenna coax. My big order from Stein is coming in the next day or two, so I will be able to start some serious wiring on the wings. Bekah and I powered through the right aileron top skin. Turned out pretty good. Harder than I thought bucking from under the bent skin. Not sure how to do it anybetter, so will just power through again on the left aileron probably next week. I also was able to figure out initial mounting of the autopilot servo in the right wing. Not complete, torqued, wired or saftey tied, but looks good just the same. I am getting a bit out of order on the wings, but its not really a problem. Just keeps things exciting. This weekend I made tons of progress on lots of things except the ailerons. Hopefully I can get to them this week, but now the wings are structurally complete except for the bottom skins. All top skins complete, aileron hinges installed, gap fairings and flap braces all installed. Since I had all the materials ready I started installing the Bell Crank and Heated Pitot. The Pitot had to be drilled to the mast which took quite a bit longer than I thought it would. I had to drill in assembly, then tap the pitot, then open up the holes in the mast. I ended up countersinking the #6 screws and it turned out pretty good. Also, the Dynon heater controller is not installed, but clecoed to the outside of the rib on the tip end of the bell crank area. I plan on installing nutplates to the outside of the control unit, so I don't have to worry about any nutplates on the ribs. Then I will just bolt the controller from the access area near the bell crank. Should work well, you will see. Also, you can see I installed the conduit, which is "LOUD" and also takes a while.. But got it done. Top Skins - Looking Smooth! Bekah and I were able to do a bit more riveting on the top skin last night. Almost free of Clecos ! Tomorrow a friend who actually got me first interested in RV's about 10 years ago is coming over to help finish up riveting the top skin. Every other rivet remains, but we should be able to kick them out in an hour or so. The rivets are already inserted with post-its over them holding them in place. Works well, and once the riveting starts, it goes quick.